I booked us in for an all day tour, which was really two separate two hour tours with a three hour gap in the middle where you could do your own exploring and have lunch. 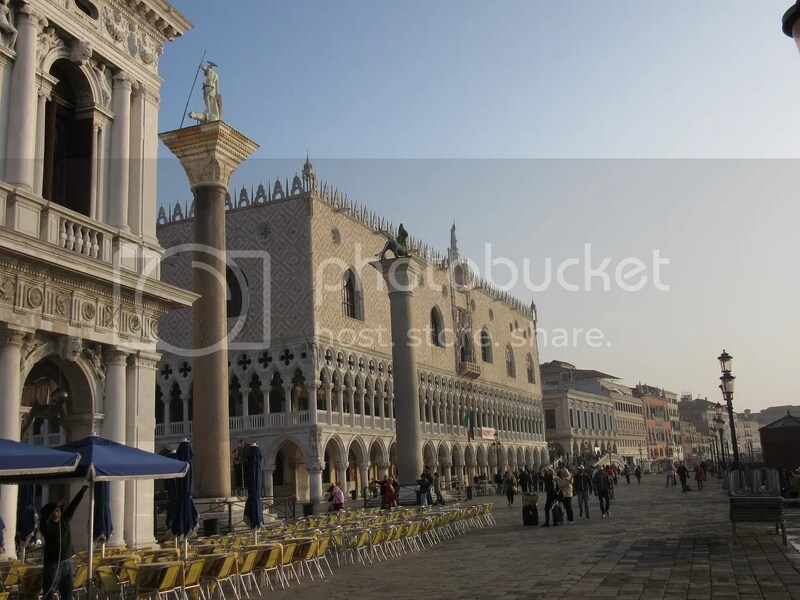 The first part centered around the Doges Palace which was the historic seat of Justice for the Republic of Venice, and of course the residence for the Doge. It also had a private chapel, but more on that later. It is sinking by 15cm every hundred years. Which, where I come from doesn’t sound like much. It feels like Australia only just celebrated a bicenterary. But, when your palace has been standing since 1100(ish) … well, it’s going to make a difference! Those front columns used to be MUCH taller! For a while, they were counteracting the sinking land vs rising sea by just slapping down a new floor to the palace and piazza every so often. But they’ve stopped doing that now. All that extra stone, is extra weight and makes them sink faster. Yes, really. This tour finalised with us crossing the Bridge of Sighs to the “new” gaol from the Court of Justice’s Interrogation Rooms. Convenient, no? 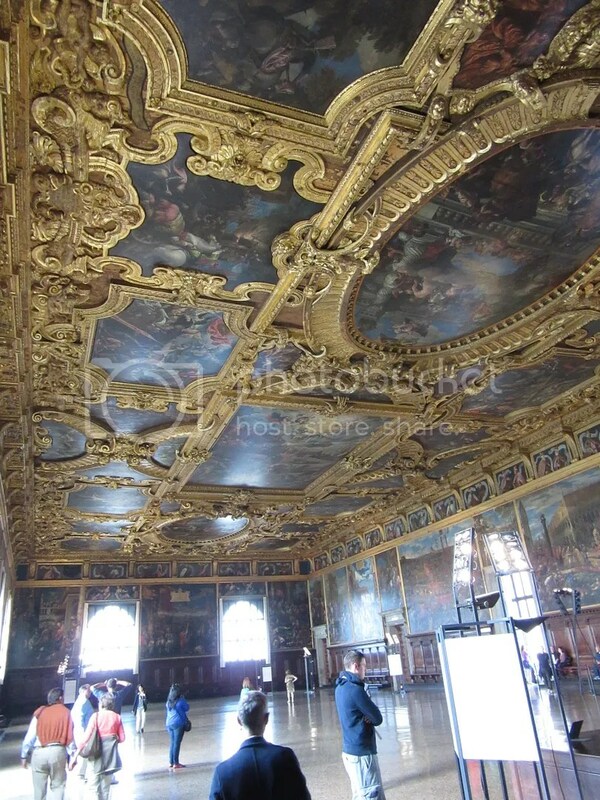 That picture above is the last look at Venice many prisoners ever got. We had a lunch break then, and just as well because we had lots of things to think about and even look at around Piazza San Marco. There was a little water on the ground. Please note the ripples on the right of water coming UP out of the drain. Also note that it’s not considered “flooding” (locally – “high water”) until it’s 110cm. I was drawn to the most elegant, fine, and expensive of the café’s surrounding the Square, Café Florian. 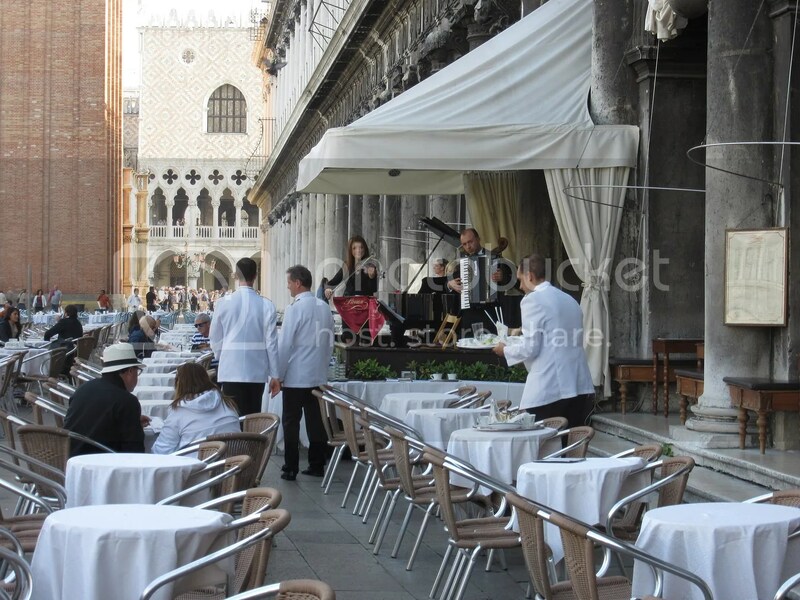 Though in all honesty, if you’re going to eat in this Square, wouldn’t you head to the one with the live jazz band? You only live once, and the affogato was to die for! 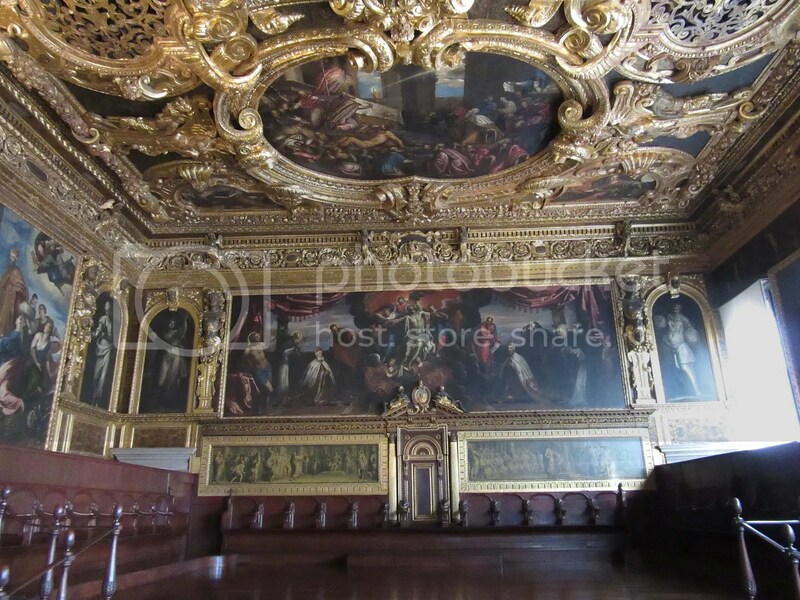 The next part of the tour was all about Venice and we began by heading into that neat little private chapel that I mentioned earlier. You remember when I mentioned that private chapel, for one man? 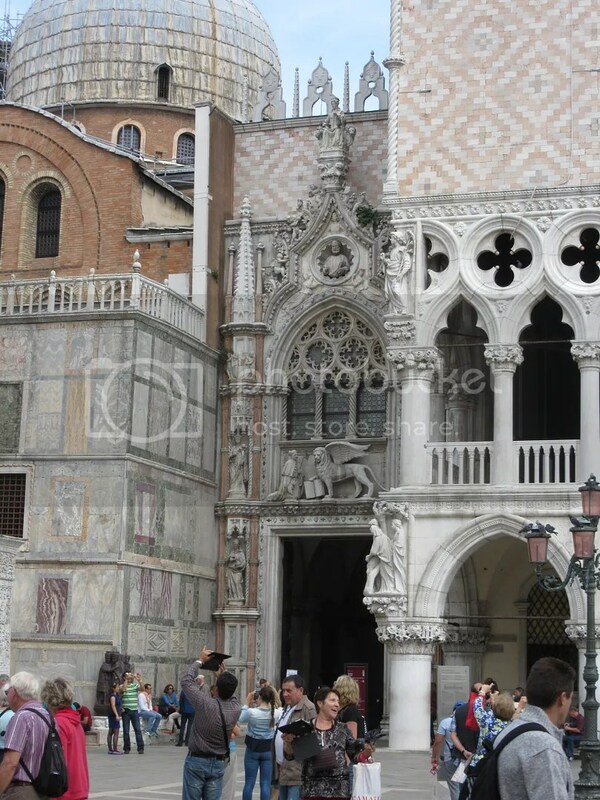 Yeah, now look back up at the picture of St Marks Basilica. Originally one man’s private chapel. Also, (supposedly) actually houses the remains of the Apostle Mark too. Most of them. Apparently they did decide that they should hand back part of him to the people they stole him from. The skull was handed back in the 1960’s. The story is laid out in quite detailed mosaics on the front of the Chapel. And hence the winged, book reading, lion all over Venice. 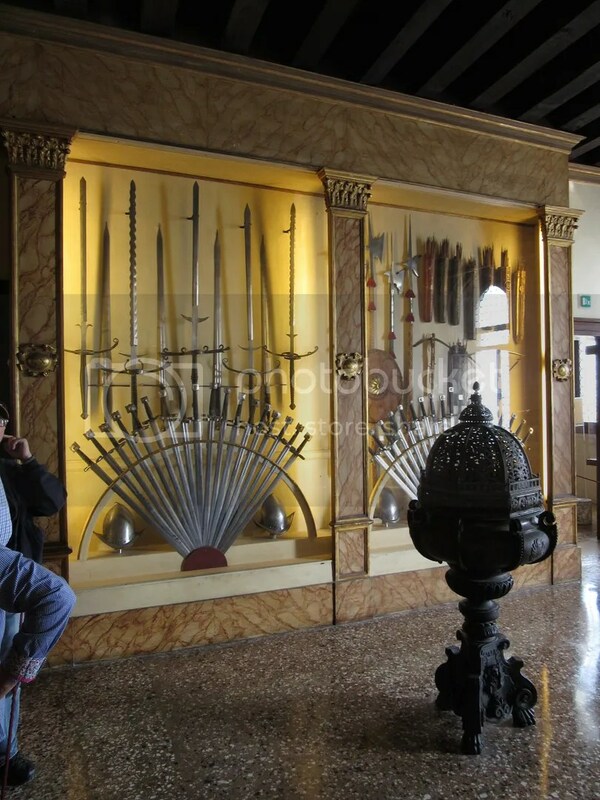 It is his symbol, and he is the Patron Saint of Venice. 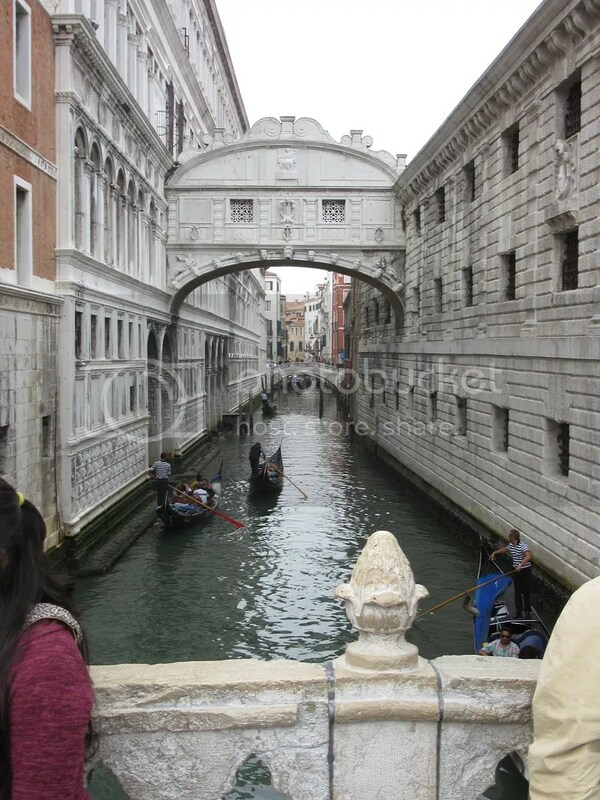 Once we had gone through there (active church, no photos allowed, you’ll have to google for naughty people’s photos as I didn’t take any), we wandered with our little guided tour through all the little alleys and lane ways of Venice! It was amazing, wonderful, and very informative! 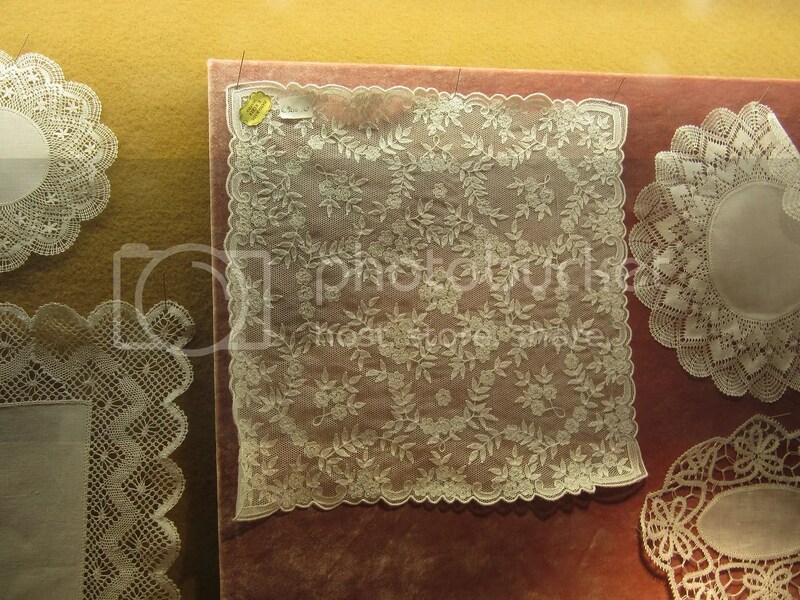 Because I can, here is an example of the hand-made lace handkerchiefs that I was hankering after. It’s only €200. It was in one of the shop windows we went past. 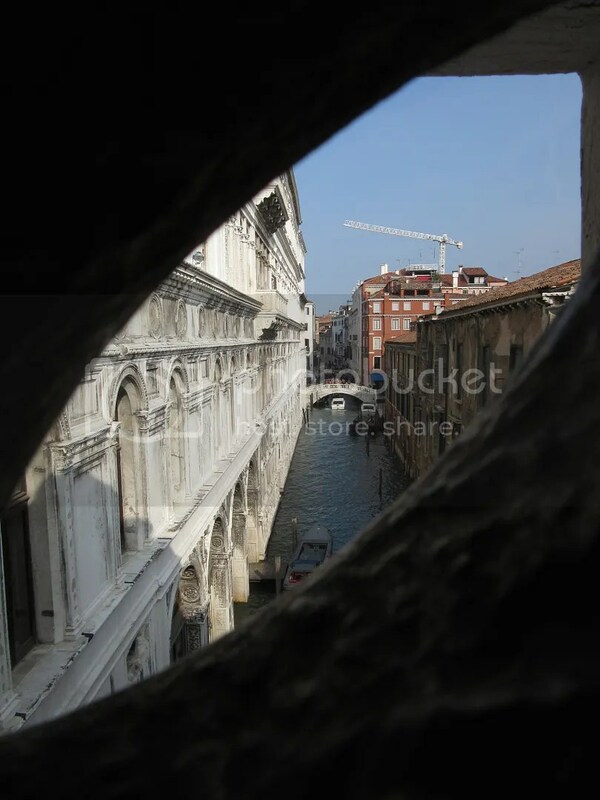 This tour concluded out the back of the Palace again, and we found ourselves with a wonderful view, now of the outside of the Bridge of Sighs. It was a long day what with four hours of touring, and so we headed off to our final destination of the day which was Harry’s Bar. Harry was the inventor of the Bellini, and what better place to have one than where they were invented! It was an experience, we had it, it was crowded, rowdy, and expensive. My preference if you’re short on time is Café Florian! More next week! Have a wonderful weekend everybody! Sounds like a very very busy day. So much learned and seen! And what a handkerchief! The hours and hours of work. Wow. It’s interesting to hear the comparison of perspectives on water rising/cities sinking. 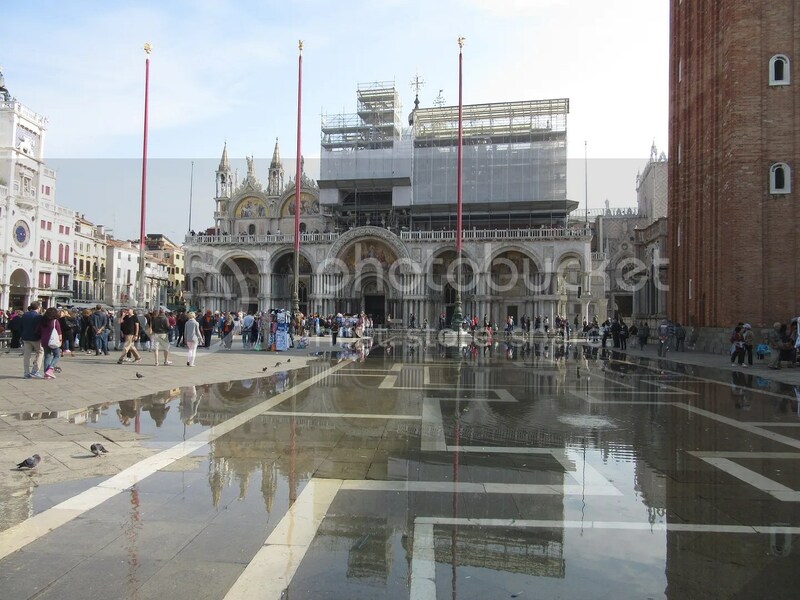 And I had never seen the precise figure for “flooding” in Piazza San Marco; we still remember photos from a few years back, with the standing water many feet deep and tourists still wading through, all in improvised galoshes and ponchos. There was a lot to take in from those two tours! But the guides were well versed, enthusiastic, and very personable! So they were a delightful experience and well worth the investment! I was kind of hoping the water level would be higher 😉 Though I’m sure if it had been it would have been a pain to get around! We did think of taking galoshes, but in the end decided against it. Have fun in the garden! What there is of mine is almost all died off for Winter now. The ivy is about the only thing still going strong!